Faraway Press: The Online Home of John Jackson Miller: Lost Tribe of the Sith #5: Purgatory now online! Download free! Lost Tribe of the Sith #5: Purgatory now online! Download free! 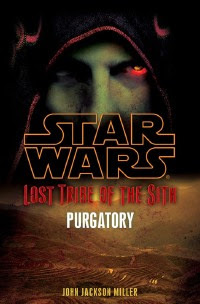 The fifth installment of Star Wars: Lost Tribe of the Sith, titled "Purgatory", is now online. The free download is now available at StarWars.com and also Random House's Suvudu. I'll link other major download platforms as I have them. It's my second electronic story online in less than a week, but it's completely different in many ways — and quite different from the previous episodes of Lost Tribe. Much time has passed since the fourth episode, as you'll see. This story also has an ending you may not expect — avoid spoilers! Speaking of unexpected, I finally have production notes online for Lost Tribe: Paragon and Lost Tribe: Savior. I'll have notes for Part 5 on my page for the e-book later on, hopefully later this week. Knight Errant: Influx, prequel story, now online! D-Day for Sith space: Knight Errant #1 arrives! Mass Effect: Evolution launches Jan. 19! One week to Star Wars: Knight Errant #1!